About – Al Shirawi Electrical & Mechanical Engineering Co. L.L.C. We undertake and implement turnkey contracts encompassing design, engineering, supply, installation, testing and commissioning. With 2,000 strong skilled labour force, qualified engineers, technicians, draftsman and experienced project managers, we are committed to delivering quality work. We are fully equipped to meet the most rigid specifications and execute work in the most challenging conditions. 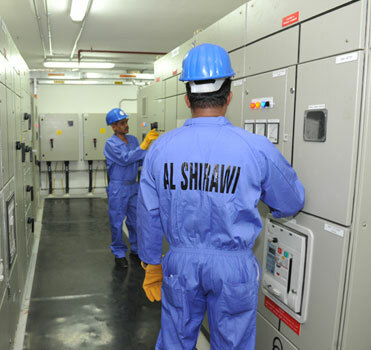 Al Shirawi Electrical & Mechanical Engineering Company’s strength also lies in its pedigree. As part of the Al Shirawi Group of Companies, the highly successful privately owned business conglomerate, we enjoy the financial support to complete demanding projects. We are closely plugged into a network of complementary businesses as well, including the UAE’s largest manufacturer of ductwork and the leading distributor of HVAC equipment. As a team, we are committed to quality and adhere strictly to the standards laid out by the ISO 9001:2008.We also have in place a strong Health, Safety & Environment (HSE) policy. The result is an untainted track record of delivering projects on time and to set expectations, making us one of the most preferred MEP partner for clients, contractors and consultants alike. Oasis Investment Company LLC (OIC), the holding company of the Al Shirawi Group of Companies, was founded in Dubai in 1971, by two visionary leaders – Abdulla Al Shirawi and Mohan Valrani, who currently serve as Chairman and Senior Vice Chairman of the Board, respectively. From its humble beginnings as a trading and contracting company, the Group has grown into one of the largest private business conglomerates in the UAE. The reigns have now been successfully passed on to the second generation of leaders. Today, the Al Shirawi Group has 34 companies in diverse business sectors. Each company is an independent profit centre, able to draw on the unrivalled in-house resources and technical expertise of the Group’s complementary businesses for its success. With an annual turnover of USD 1 Billion, Al Shirawi has earned its place as a global player. We aim for zero accidents on all our project sites. Hazards avoided with constant monitoring of risks. All critical activities are carried out on the issue of work permits and controlled for safety. Continuous assessment and monitoring of subcontractors including legal documentation, method statements and physical inspections. 100% complaint with the authorities mandates for essential safety and personal protective equipment. Al Shirawi Electrical & Mechanical Engineering Company has been certified to meet the stringent requirements of ISO 9001:2008 for all activities related to MEP work. The company has a team of dedicated and qualified professionals to monitor, measure and continually improve each element of the organisation’s service functions through rigorous audit process verification and validation checks. A comprehensive quality plan is prepared for every project as per the project’s inspection and test plan that is regularly vouched for compliance, with the support of well-established management systems. Our in-house quality assurance team ensures that the planning and execution of work are done to meet the Project specifications, achieve customer satisfaction and sustainable growth. Our commitment to quality is further reinforced through our participation in the Dubai Quality Group | Continual Improvement Group. At Al Shirawi Electrical & Mechanical Engineering Company, sustainability means managing our business responsibly and ensuring we consider social, economic and environmental factors in the decisions we make to ensure long-term business success. We believe it is our duty to our customers, investors and employees to foster an ethical, socially responsible and sustainable corporate philosophy. In all of our projects, we recommend sustainable products and solutions be incorporated into the MEP fabric. Through stringent procurement measures, we support the consultants and contractors in meeting their sustainability and LEED objectives for a project. Apart from Al Shirawi’s performance, we would like to appreciate the Project Management and the co-ordination skills of its personnel. Besides, the health and safety practices at the site were strictly followed to meet industry standards. We congratulate Al Shirawi Electrical & Mechanical Engineering Co. for the timely completion of MEP works for our project Dusit Marina. We commend the performance, dedication and the quality of work executed by Al Shirawi to the satisfaction, of the Consultant, the Client and the main Contractor. The level of skill and service was highly commendable and we are happy to note that a great emphasis was laid on health and safety.